Margaret Bragg does not own a single cookbook. She measures in "dabs" and "smidgens" and "tads" and "you know, hon, just some." She cannot be pinned down on how long to bake corn bread ("about 15 to 20 minutes, depending on the mysteries of your oven"). Her notion of farm-to-table is a flatbed truck. But she can tell you the secrets to perfect mashed potatoes, corn pudding, redeye gravy, pinto beans and hambone, stewed cabbage, short ribs, chicken and dressing, biscuits and butter rolls. The irresistible stories in this audiobook are of long memory -- many of them pre-date the Civil War, handed down skillet by skillet, from one generation of Braggs to the next. 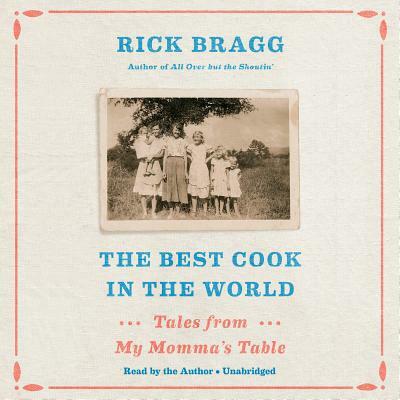 In The Best Cook in the World, Rick Bragg finally preserves his heritage by telling the stories that framed his mother's cooking and education, from childhood into old age. Because good food always has a good story, and a recipe, writes Bragg, is a story like anything else. RICK BRAGG is the author of two best-selling books, Ava's Man and All Over but the Shoutin'. He lives in Alabama.